# Peel away the vegetables and chop them. # Put the meat, vegetable cubes, oil, green peas, salt and oregano into a mixing bowl. Mix them. # Prepare 6 grease-proof papers those have service plate size. # Divide the prepared mixture onto the middle of those 6 papers. 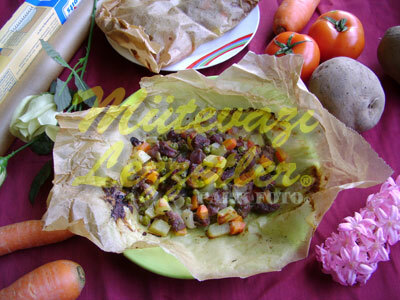 Then cover those mixtures over the paper by the non kebap places parts of those papers. Twist the ends of the papers to close them. # Make a small cut at each packaged paper by a knife. # Place those kebap packages into the baking tray. Place the tray into the oven which is preheated to 375 F and cook them for 50 minutes at least. Note: If you do not make a cut at the packaged papers, the packages may lose their shape during the cooking.